We offer a wide assortment of Waterproof Canvas to our esteem clients as per their various needs and requirements. The offered canvas is manufactured using optimum quality fabrics and is accessible to our clients in different colors and specifications. 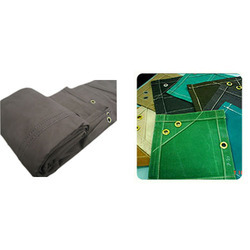 A.K.Industrial Fabrics offer a wide range of Waxed Proof Canvas. Our fabric treatments protect canvas from Weather Extremes, Tropical Rains, Moulds, Rotting, Ultra Violet etc. Our highly skilled and talented workforce assists us in offering quality Waxed Canvas Fabrics in the market. Customers can avail this fabric in different colors as per their requirements. The fabrics can also be given Wrinkle Resistant Treatments, Flame Resistant Treatments, Oil Resistant Treatments and Disruptive Prints etc.